Hard to believe, but this is Balashon's 500th post! Since I started the site in February 2006, there have been many fluctuations in post length and depth, and the frequency of posting has also varied considerably. But my interest in the subject of etymology hasn't changed, and I'm very grateful that you have continued to read and follow me for so long. I'm also particularly appreciative to those of you who click on the Google and Amazon ads and links - that small amount of income has allowed me to reinvest in resources. Just recently with that revenue, I was able to purchase a book I was interested in for a very long time, Michael Sokoloff's A Dictionary of Jewish Babylonian Aramaic. This book, which was published in 2002, is a fantastic resource for researching Aramaic words from the Babylonian Talmud (of which many influenced later Hebrew words) and has in-depth etymologies as well. For today's post, I thought I'd look at the methodology of Sokoloff, as well as a number of his predecessors, and hopefully you'll get some insight into how I do the research for Balashon. The word I'm looking at is alunka אלונקה - "stretcher, litter". Looking at Talmudic dictionaries is helpful, since the word appears in the Talmud, Beitza 25b, although in a slightly different form: אלונקי alunkei. In the preface to his dictionary, Jastrow explains his motivation in his etymologies - to regain words "from foreign origin for Semitic citizenship" and "unless conditions of importation are apparent, the presumption should be in favor of the home market." If possible, he will always prefer a Semitic origin to Talmudic words. He accused Krauss of "proclivity to find Latin and Greek in words indisputably Semitic" and said that "led the author into a labyrinth of fatal errors." However, in many cases, by sticking with his approach, Jastrow seems lost in a parallel labyrinth. 1550s, "line of battle in close ranks," from Latin phalanx "compact body of heavily armed men in battle array," or directly from Greek phalanx (genitive phalangos) "line of battle, battle array," also "finger or toe bone," originally "round piece of wood, trunk, log," of unknown origin. Perhaps from PIE root *bhelg- "plank, beam" (source of Old English balca "balk;" see balk (n.)). The Macedonian phalanx consisted of 50 close files of 16 men each. In anatomy, originally the whole row of finger joints, which fit together like infantry in close order. Figurative sense of "number of persons banded together in a common cause" is attested from 1600 (compare Spanish Falangist, member of a fascist organization founded in 1933). 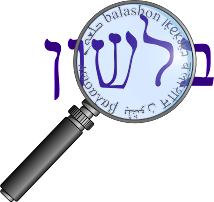 The abbreviation ל"פ means לשון פרסית - "Persian Language". 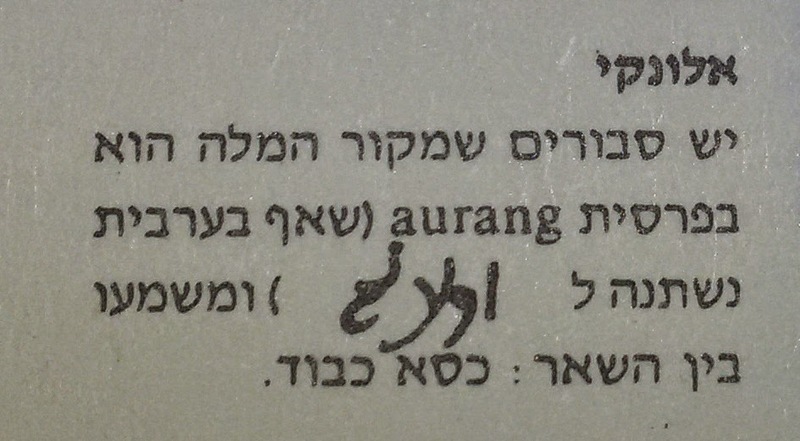 (I can't read the non-Hebrew script following that - if any readers can, please let me know). Many of Kohut's Persian etymologies are rejected by modern scholars. However, in this case, Persian is the generally accepted theory. He writes that some claim that the word derives from the Persian aurang, meaning "throne", and that word has entered Arabic as well. Aurang, or an alternate aurand, can additionally mean "glory" or "beauty" (not clear to me which meaning is earlier). "a covered litter," 1580s, from Portuguese palanquim (early 16c. ), from Malay and Javanese palangki "litter, sedan," ultimately from Sanskrit palyanka-s "couch, bed, litter," from pari "around" + ancati "it bends, curves," related to anka-s "a bend, hook, angle," and meaning, perhaps, "that which bends around the body." Some have noted the "curious coincidence" of Spanish palanca, from Latin phalanga "pole to carry a burden." The two words - palanca (phalanga) and palanquin are certainly similar in both meaning and sound. Perhaps the Portuguese form was influenced by both the Asian and the European roots during their time in India, or maybe there was even earlier contact between the languages. No one seems to be sure, and doubt is not a bad thing in etymology - I certainly prefer it over unjustified confidence. So if this is true - then while alunka might not have a Semitic grandfather, it could very possibly have a Hebrew cousin - apiryon! As I once wrote, the real search for roots - in genealogy or etymology - can often be more rewarding and fascinating than playing a linguistic version of "Separated at Birth". 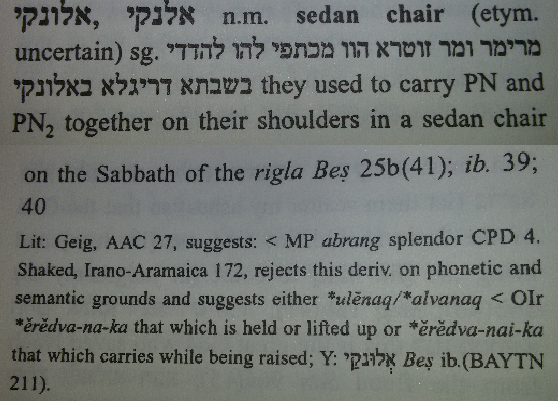 The first suggestion he mentions, abrang, seems to be related to Steinsaltz's suggestion of aurang (see here). I can't find any cognates regarding the second suggestion. So why is this entry so exciting? It's less interesting than Klein's proposal, and what I discovered based on it. But what Sokoloff provides, which none of the books I've quoted until now did - is the sources for the etymologies! That's so important, and yet until I acquired his book, I had no idea how much it was missing. I'm sure Klein, Steinsaltz and the others did research and had reasons for their theories. But without documentation, it all just seems like speculation. So I'm hoping that I will benefit from my future research with this new book, and I hope you will as well. You might be asking one last question. Why didn't I quote Ben Yehuda? It turns out - there's no entry for alunka in his dictionary. He began work on it in 1908 and continued until his death in 1922 (the final editing continued after he died). I found use of the word alunka in newspaper articles beginning in 1915, and books from the 1920s. These were without explanation, so it's likely the word was used in speech for a while previous to its appearance in print (it's unclear to me who started using the Hebrew alunka instead of the Aramaic alunkei). Why did Ben Yehuda leave it out? Probably because he believed it was of foreign origin, and he generally avoided including words of that nature. And while Jastrow might have disagreed - it seems that Ben Yehuda was right!